This guide by The Kent Stove Company is designed to help you find your way around some of the jargon and terms you will come across as you search the world of wood-burning and multi-fuel stoves, often referred to as “woodburners” or “stoves”. While we’ve tried to make it as accurate as possible it is a general and generic guide, not a technical manual. There may be more than one correct way of doing or describing things. For individual stoves always follow the manufacturer’s instructions and user manuals. Nothing burns without air. Petrol, gas, rocket fuel, coal and logs all need a supply of air to burn: combustion. Most modern stoves have two, and often three directions of air supply. Some use just one control lever, some two, and some three separate controls. 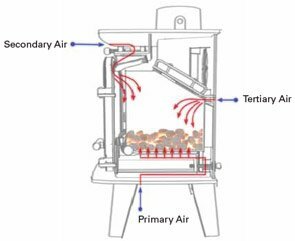 Primary Air is generally fed into the base of the stove and is mostly associated with providing combustion air from below for solid fuel or coal. Secondary Air is generally fed in towards the top of the stove and mostly provides combustion air from above for burning wood. Tertiary Air is usually fed into the back of the stove, above the fire bed, and adds air to any unburnt gases from the primary burn, igniting them for a clean and complete burn. Wood burns best on a bed of ash on a flat base with a supply of air from above or at the same level. The primary air is therefore closed down once the stove is fully lit and the airflow controlled with the secondary air control. Coal burns best with a supply of air from below. In a multi-fuel stove a grate / grill is fitted to supply air from beneath the fire bed. When burning coal the secondary air should still be used and provides a downward flow for airwash (keeping the glass clear). Once fully lit the primary air control should also be used to provide an air supply for the coal. Stoves do vary: see your user manual. Tertiary air is often supplied at a fixed rate as it’s purpose is just to ignite any unburnt gases on their way out of the stove. This also gives an impressive “dancing flame” display. On some models it is controllable for fine tuning the flame. Stoves with a nominal output greater than 5KW require an “Air Vent” to be fitted to supply a sufficient quantity of air for the stove to perform properly and safely. You may notice a number of stoves on the market with a claimed maximum output well in excess of 5KW but which conveniently have a quoted “Nominal output” of 5KW in order to get around this requirement. New build properties are so well sealed up as a result of modern building regulations that they will require an air vent regardless. As a rough guide, by “new” we are talking generally about properties built after the 2008-2010 period. In properties built prior to this and those that have not subsequently been “sealed up” it’s generally taken that they’re “leaky” enough not to need a vent for stoves up to 5KW. Thereafter a vent of just under one square inch for every KW over 5KW should be fitted. An 8KW stove therefore would require a vent of just under 3 square inches in size or 40 square millimetres. The vent must be permanently open. Common now on almost all new stoves. This is a design feature where the flow of air through the firebox is directed down the face of the stove glass keeping it clear and preventing the glass going black and sooty. Coal produces much more ash than properly burnt wood. Coal can only be burnt on a multi-fuel stove. This will have been will been fitted with a grate / grill and an ash pan beneath for ash removal. As wood burns better on a bed of ash it should not be completely cleared out. When it becomes excessive some should just be removed with a small shovel. A baffle plate is a metal plate that sits internally over the firebox. The baffle plate blocks off the chimney and forces hot gases to remain in the stove for a longer period. This increases the efficiency and heat output of the stove. It can be removed for chimney sweeping and may need replacing after long use. Sometimes more correctly referred to as a room-sealed appliance and can be a solution where a property has no masonry chimney and a freestanding flue-pipe would be inappropriate. It uses two, twin pipes or ducts coming straight from the back of the stove through the wall to outside. Not suitable for wood or multi-fuel burning stoves. Stoves can be be made of all cast iron (a hard, relatively brittle alloy which can be readily cast in a mould), all steel or different parts made of a combination of the two. It is common for steel stoves to have cast iron doors as this offers wider design options. Steel stoves tend to heat up and radiate heat more quickly but then lose it more quickly as the fire dies down. Cast iron is slower to radiate initially but lasts longer and gives a more even heat with fewer peaks and troughs. With modern materials both are arguably equally durable. Some prefer the look and feel of cast iron but it is generally more expensive than the steel equivalent. There is enough information and regulation around chimneys to fill a complete website. We will therefore only cover the basics here. Any specific advice can only be given by surveying your property, establishing what you have now and what type of stove you would like to have installed. 1. If you have an Existing Chimney – Flexible chimney liner. A chimney liner can be fitted. This is a flexible metal tube – usually 5 or 6 inches in diameter – that is fed into your existing chimney and connected to the stove at one end and a cowl on the chimney top at the other end. This provides a safe, sealed path from the stove to the outside of the building. 2. If you do not have a chimney – Twin Wall System. This is a rigid stainless steel tube with an inch of insulation around it and then a second tube around that (twin wall). This pipe comes in sections and can either go straight up through the house and roof or directly through the outside wall and then externally up the side of the building. This is becoming a generic term used by some manufacturers for the system whereby air is fed into a stove above the main fire bed, sometimes referred to as “Tertiary Air” (See “Air” above). The extra oxygen provided causes unburnt gases to ignite rather than go up the chimney and pollute the atmosphere – hence Clean burn. There is also a stove company called Cleanburn. The combination of Primary air, Secondary air and Tertiary air supply to a stove is sometimes referred to a Trippleburn – another piece of jargon meaning a clean or efficient burn. This is a system where air is fed directly into a stove via a duct or pipe from outside of the building. Combustion takes place in the stove and the burnt gases then flow up the chimney / flue directly to outside again. This is instead of air being drawn into the stove from inside the building which can cause drafts as it is drawn in through leaky doors and windows. Modern buildings are so well sealed that a stove may not function properly without this arrangement, or a door / window being left ajar to provide a supply of air. A closure plate is non-combustible board that is used to cosmetically seal off the chimney above the stove when a chimney liner is fitted. It also stops heat going up the chimney and debris – old soot etc coming down. If it was not well sealed it would not be a major issue as the chimney liner provides a sealed route from the stove to the outside world. If a chimney liner is not fitted, that is to say the stove emits smoke into the chimney cavity, a Register plate is required. This must be made of stainless or galvanised steel and provide an air tight seal between the chimney cavity and the room below. In practice a stainless or galvanised plate is often fitted regardless. Always check the manufacturer’s instructions. Multi-fuel stoves can generally burn smokeless fuel and anthracite but regular house coal is not generally recommended. This produces sulphur which will damage your chimney liner and most probably your stove as well. Burning the wrong fuel can invalidate warranties. Coal should not be burnt in a wood burning stove (woodburner). Multi-fuel kits are available for some woodburners to enable them to burn coal as well. The unit on top of the chimney pot. It will often incorporate a rain cover and bird guard. The flexible chimney liner can be sometimes be suspended from the cowl. A stove is basically a metal box that is heated from the inside by burning wood or coal and radiates heat from the outside of the case into the room. If a metal “jacket” is fitted around the stove with an air gap in between, heat will rise within the jacket to be replaced by cooler air from below. This will cause a flow of air into the room which is convection. It is argued that this gives a better distribution of heat. Inset stoves that are set into a wall will rely mainly on convection to transfer their heat into the room with a certain amount of radiation coming from the front of the stove. “DEFRA exempt stoves” (the correct terminology) or SE (Smoke Exempt) are stoves that are cleared to burn specified fuels in smoke control areas. In old terms: you can use these stoves in Smokeless Zones, usually towns. This is usually achieved by including a mechanism in the stove that prevents it being fully shut down. A fully shut down stove is not burning efficiently or “cleanly” and therefore emits more polluting gases and particles. In a typical traditional open fire approximately 70-80% of the heat produced goes up the chimney and is lost. This makes the fire approximately 25% “efficient”. In wood burning stoves only around around 25% of the heat is lost up the chimney making them around 75% “efficient”. Most manufacturers quote an “efficiency” rating for each model, some claiming as much as 88%. A word of warning though: take advice before choosing an ultra-efficient stove. Hot air rises through the chimney helping to give a healthy draw. If there’s very little hot air rising the stove may prove difficult to start and keep going well. You may need to run it hotter than you wish (and burn more fuel) to keep the chimney working well. Chimney length and other local factors may favour a less efficient model. The part of a chimney which carries the smoke and gasses away, i.e. the “core” of a brick chimney or the interior of a flexible chimney liner or a stove pipe. The grill, usually made of cast iron on which the bed of the fire sits. Grates are usually only fitted to multi-fuel stoves as coal requires air from beneath to burn efficiently. Wood-only stoves do not generally have a grate, the wood burning more efficiently on a flat bed, ideally with a layer of ash beneath. The non-combustible base on which a stove stands. As a general rule a stove will require 300mm (about 12 inches) of non-combustible base, or hearth in front of the stove. Inset stoves are the type that are set into a fireplace or wall as opposed to free-standing. They can save space as they sit flush with the wall or fireplace, not protruding into the room. Many are designed to a standard size to slide into a standard existing fireplace with ease – but by no means are all fireplaces standard so it doesn’t always work out that easily. These stoves generally have an inner and outer casing, creating a jacket around the stove which transmits its heat into the room by convection as air circulates inside the jacket. There is some debate about their efficiency with positive claims that convection produces a better “flow” of heat into the room where others maintain too much heat is lost into the surrounding brickwork and that free-standing radiation is better. See manufacturers websites and brochures for claims and counter-claims. Stove heat output is normally given (or claimed) in Kilowatts. For 1KW think of the heat given out by ten 100 watt light bulbs or one bar of an electric fire as a comparison. It is not easy to prove the manufacturer’s claims or even to find out exactly how they have been arrived at. Most give a range of KW output and a “nominal” output: e.g. 3-7 KW, nominal 5KW. It’s probably best to think of the nominal output as the “normal cruising speed”; the stove is not running flat out out, nor is it idling. The actual size of the firebox may be a better guide when making stove comparisons. The more fuel – logs and / or coal that the stove can sensibly accommodate the hotter it can burn and the more heat that will be generated. See also “Air vent” and “Efficiency” above. The amount (%) of moisture (water) content contained in a material: we’re interested in wood / logs. For good operation of your stove it is essential that this is kept to a minimum and that you use seasoned dry wood. This generally means a moisture content of less than 15%. Moisture meters are available for about £25 to test the moisture content. The best way to blacken your stove glass and gunk up your stove and chimney liner – increasing the chance of chimney fires – is to burn wood with a moisture content greater than 20%. It will also burn poorly and give out little heat. A 9 inch dry log weighs about 600 grams. A damp one containing 25% moisture will therefore contain around 150 grams of water, which is about half a jam-jar full you’re throwing on the fire with every log. You can hear the “hiss” from burning damp wood. Source your wood from a reputable supplier who can guarantee you a moisture content ideally of less than 15%. Freshly cut timber should ideally season for 2 years – depending on type. Seek out “seasoned”, “barn stored” or “kiln dried” timber and test it with a meter to check it’s moisture content. Wood burns best on a flat base on a bed of ash and drawing air from above and sides. Coal prefers to sit on a grate with a flow of air from both beneath and above. The main difference between a wood burning stove and a multi-fuel therefore is one of design: a flat base for a wood burner and a grate for burning coal. Some stoves are set up for wood only with a conversion kit (a grate) available to use them with coal. Burning wood efficiently and correctly produces little ash; perhaps 1-3% by weight. Coal produces much more; closer to 6-7% and so most multi-fuel stoves are fitted with a removable ash pan. More eco-friendly and environmentally sustainable. Can burn wood, smokeless fuels, Anthracite, Peat / turf briquettes: greater flexibility. More ash created and generally need an ash pan and more cleaning out. Some fuels can produce greater temperature than wood equivalent. Some fuels can last longer than wood equivalent so less frequent refuelling and possibility to keep the fire in for longer. Greater flexibility: if you can’t hold of logs / wood you can use an alternative. There is a myth that you can throw any old rubbish on a wood burner, heat your house for free, and all will be well. While it’s great to find a source of scrap / free wood and save costs it pays to to be a little bit careful in what you burn. Firstly see “Moisture content” above. Then consider if your free / reclaimed timber has been “treated” with preservatives. While regulations are much tighter these days some of the “old wood” you might find may have been treated with all sorts of very nasty chemicals that will do neither you nor your stove any good. See this advice from a wood supply company. Best wood for your stove. This this page from Charlton & Jenrick lists the good, not so good and bad woods for stove burning. For in-depth information about wood and other solid fuel visit this page at The Solid Fuel Technology Institute. Forestry commission advice on DIY sourcing wood for wood stoves: Click here.